It seems rather incongruous that a man of just 26 years-old should reflect on any event in his professional past as occurring "a lifetime ago". But so much has changed, in such spectacular fashion, in the near-six years since Chris Fusaro first pulled a Glasgow Warriors jersey over his meaty shoulders that perhaps it's not so flippant a remark. 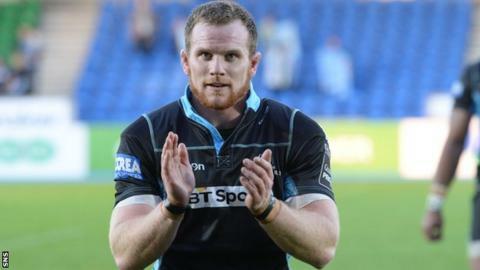 When the Pro12's bottom side Treviso visit Scotstoun on Friday night, flanker Fusaro - together with prop Ryan Grant - will trot down the tunnel to register his 100th appearance for the club. "It feels like it's flown in in some aspects," he begins. "Then looking at all the young guys that are in the squad now, it makes you realise you have been around a long time. "It's kind of crept up on me a bit." Indeed, it wouldn't be entirely remiss to label Fusaro a veteran, if not in rugby terms, then at least where the Warriors' evolution from plucky upstarts to powerhouse champions is concerned. Cast in the traditional "fetcher" mould, the openside has long been a compact nugget of effervescence battling amid an ocean of behemoths. "I think we've had a transitional period, coming from (former head coach) Sean Lineen into Gregor (Townsend) and then really cementing our places as one of the top teams in the Pro12," he says. "We're getting closer; we obviously need to get out our group in Europe, that's the next step. "At Glasgow we've had a sense of professionalism instilled in us, and that's throughout the whole squad and the backroom staff, our strength and conditioning coachers, our head coaches. "I think the quality of players we've got now, that's taught me to be a better professional. You have to play to your potential every week, and that drives us forward as a squad." Banal talk of culture and ethos are press conference staples, but Scotstoun bears more visibly striking testaments to the Warriors' constant thirst for improvement, the "growth mind-set" driven by head coach Townsend. The place is awash with these reminders, slogans and mottos emblazoned around the training paddocks, and pictures of club greats adorning the walls as you ascend the staircase of the main stand. Through his aptitude and attitude, Fusaro has established himself as a leader, and earned the admiration of his peers and supporters. As Townsend says of he and Grant: "they're liked, they're loved and respected by their teammates." "Our archway when we run out to training says 'privilege to play'," adds Fusaro. "I think that's the message you always have to remind yourself of. "We are in a very fortunate position; when you're having a bad day, you're doing something you love for your job. "I think that is something you can't lose sight of especially as a professional sportsman because you are in massively privileged position. "If you let the bad days get to you and you lose your enjoyment, that's when it becomes not fun at all. "Remembering to enjoy it all the time is one of the key messages I've taken on board." Peaks and troughs are often the elite athlete's bread and butter - take Fusaro's unforgiving Scotland debut, the first of a four-cap tally, in the Calcutta Cup of 2014. Having been passed over during the autumn series, the flanker replaced jettisoned skipper Kelly Brown in a manner that seemed almost cruel. On a pitch ravaged by the infamous Murrayfield maggots, Scotland were bludgeoned and squashed by an England side that ought to have racked up a greater scoreline than their eventual 20-0 victory. "Representing your country is obviously a dream for every young pro, and doing that was the pinnacle of my career so far," Fusaro says of his Test bow. "That was an incredible experience at Murrayfield. "I had a taste of international rugby about 18 months ago and I'd love to get back in the Scotland squad. The way we play at Glasgow gives you every chance to do that. "Achieving consistency at Glasgow playing week after week, that's obviously one of my massive goals, and hopefully as a consequence of that I'd love to get back in the national team."